I am thinking of buying a GFO Reactor. I've been trying to read up on them, benefits etc., as well as bio pellets, but find more information regarding various reactors, rather than the function of them. The reason I am looking at this, is I've got a good outbreak of cyano and its getting worse, not better. I've got 2 mp40's set on reef crest - both at 100%, and a RO 5000 skimmer, 180 gl tank. Livestock is 7 fish total - 2 clowns, 2 wrasses, 1 cardinal, 1 royal gramma and 1 hippo tang. Mix of LPS, couple of SPS and softies, snails, hermits and shrimp and sand sifting starfish, approx 140lbs of lr. Fish are fed every second day, the only place that is clear of cyano at the moment is the front centre of the tank. Running radions at 60%, sunrise at 10 am, sunset at 11 pm, peak intensity at 4 pm. 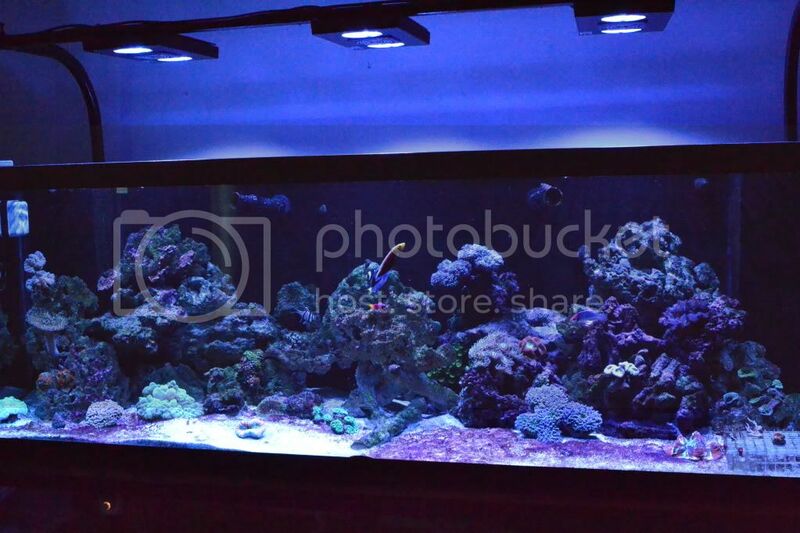 I have photos of the tank if it will help, just haven't loaded them to photobucket yet. I would reduce your light a bit until the Cyano goes away, then slowly bring it back up. Oh, and you probably already know to baste it off the rocks... but just in case. That's it?? I knew about the lights, just need the bf's laptop to change. Will baste the rocks, and remove what I can. Try MB7. It adds beneficial bacteria that will out compete cyano. It's a simple organism It needs light and nutrients (not much) to survive. Adding GFO would also be a good idea. Having low or no phosphates in your tank will definitely help. Limiting phosphate will definitely slow down the cyano. The cheapest and easiest method to get rid of Phosphate is with Foz Down. Here is a link to the product website. I use the Foz Down in my SPS culture system to control phosphate and I use VSV dosing for the nitrates. www.oceanfreshaquarium.com/foz-down.html - Foz Down - an easy way to eliminate algae outbreaks caused by Phosphate and bring back the fun of reef keeping. I have rowaphos (sp) in a sock placed at the first baffle in the sump. I don't have filter socks/holder but was told this would work regardless. I'm concerned I don't have enough flow. I will check out the products noted and see if I can turn this around. I took this pic last night, all issues are in the front on both sides of the tank, flow seems to blow the sand where the bare spot is.... thanks for the help!! we use biopellets in our SPS LPS tanks.